All women of the parish are welcome! The group meets on the first Monday of the month at 1:00 pm in the school library. 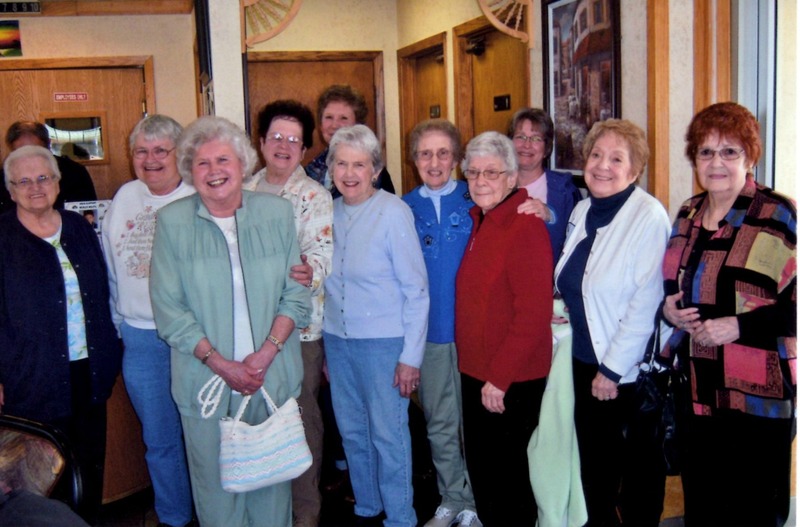 The ladies pray, supply dinners for parish funerals, sponsor parish events such as monthly coffee & donuts after Masses, special event dinners, special events for school children, Mother/Daughter dinners, in addition to sponsoring social events. Call President Pamela Drane: 815-626-1722 for more information. Parish widows are invited to attend the first Saturday 8:00 am Mass, followed by a social breakfast at a local restaurant. Call Eileen Linton 815-625-0210 for more information. An adult bible study meets weekly on Wednesdays at 7:00 pm. Call Loreta Anning 815-535-7676 for more information. The Altar and Rosary Society meeting was on March 4, 2019 at 1:05 PM. There were 11 ladies in attendance. We started by saying the Rosary for the parish’s sick and shut-ins. The next Coffee and Doughnuts will be held on March 31st after the 7:30 and 9:30 AM Masses. There were 14 ladies who attended the Widow’s Breakfast on March 2nd. The Church Women United Meeting was postponed until April 5th at the First Christian Church in Rock Falls. Please call Eileen Linton if you are interested in attending. The Altar and Rosary Lunch was at Gazi’s in Rock Falls on February 21st with 11 ladies attending. The next Lunch will be held at Touch of Thai II in Rock Falls on Thursday, March 21st at 11:30AM. Call Pam Drane if you wish to join us. The Bishop’s Luncheon is at the Brandywine in Dixon on March 13th. There are new curtains in the front of the Altar and Rosary shelves in the back of the school kitchen. Sally Wescott gave us an update on the Backpack Program for the school: She was selling chances for a meal for 50 people at Froggy’s to raise funds. We picked the winner out of a hat—Monica Sanders. Pam Drane gave a Soup and Sandwich Dinner after the 5:30PM Mass on Ash Wednesday. The proceeds went to the Backpack program. It was approved that whatever funds that Sally Wescott needs to finish out the year, the Altar and Rosary will provide. The first bags will be filled on March 8th, and every Thursday thereafter when school is in session. There was a nomination of officers. Pam Drane was nominated for President, Betty Widolff was nominated for Vice President, Rosemary Pizarro was nominated for Secretary, and Sally Wescott was nominated for Treasurer. The election of officers will be next month at the April 1st meeting at 1PM in the school. Clarise McGinn will give us a history of the Catholic churches and schools in Sterling and Rock Falls at the next meeting. Each of us will also bring a favorite prayer or reading to share.